As you learn to trust and act on your sense of intuition, it will continue to strengthen. Soon, it will become like any other sense, and will guide you toward good, and away from danger every day. If you saw a train coming toward you, you would move out of the way. If you hear a phone ring, you answer it. 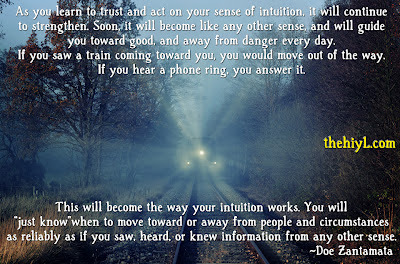 This will become the way your intuition works. You will "just know" when to move toward or away from people and circumstances as reliably as if you saw, heard, or knew information from any other sense. Thank you :) Thank you for making everything so clear and so simple.